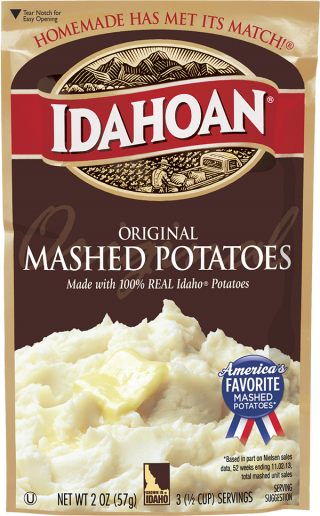 The Gold Standard since 1960, 100% REAL Idaho® Russets are the foundation of Idahoan Original Mashed Potatoes – the original comfort food. Combine water, salt and margarine* according to chart below. For best results, do not add milk until Step 3. Add cold milk; stir in potatoes gently and let stand until moist. Whip lightly with fork and serve. Note: For a creamier mashed potato, stir in additional hot water or milk. Less salt can be added if desired. Note: All microwaves vary and heating times may have to be adjusted. Combine water, salt, and margarine* according to chart below in microwave-safe serving bowl. Heat to a boil in microwave on high setting. Note: Microwaving not recommended for over 6 servings. Remove from microwave. Caution: Serving bowl and liquid will be hot. IDAHO® POTATOES WITH EMULSIFIER (MONOGLYCERIDES) AND PRESERVATIVE (SODIUM ACID PYROPHOSPHATE, SODIUM BISULFITE, CITRIC ACID, MIXED TOCOPHEROLS).